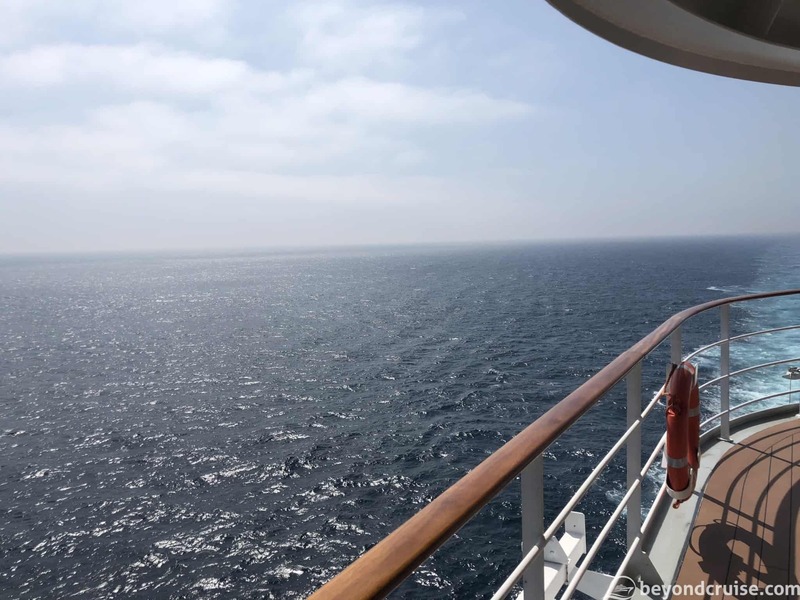 Today we are at sea as we travel around the Southern coast of Spain and head North up the coast of Portugal towards our next destination, La Coruna, which is in the far North of Spain. We are due to arrive tomorrow morning at 9am after sailing approximately 718 nautical miles. As we were at sea we decided we’d take it easy – I mean, why not? That is what sea days are for, right? We had a leisurely breakfast in the Sahara buffet (you’ll have guessed we quite like this venue by now) at around 10.30am and we enjoyed the seaviews. Today it is a little breezy, highs of around 16c and the weather doesn’t know what it is doing – one minute we have pouring rain, the next bright sunshine. There are rainbows appearing every few minutes it seems. 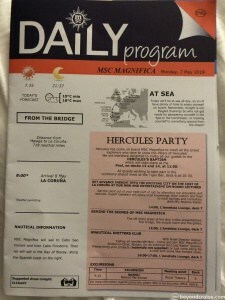 Looking at the Daily Program today, there is a lot on! 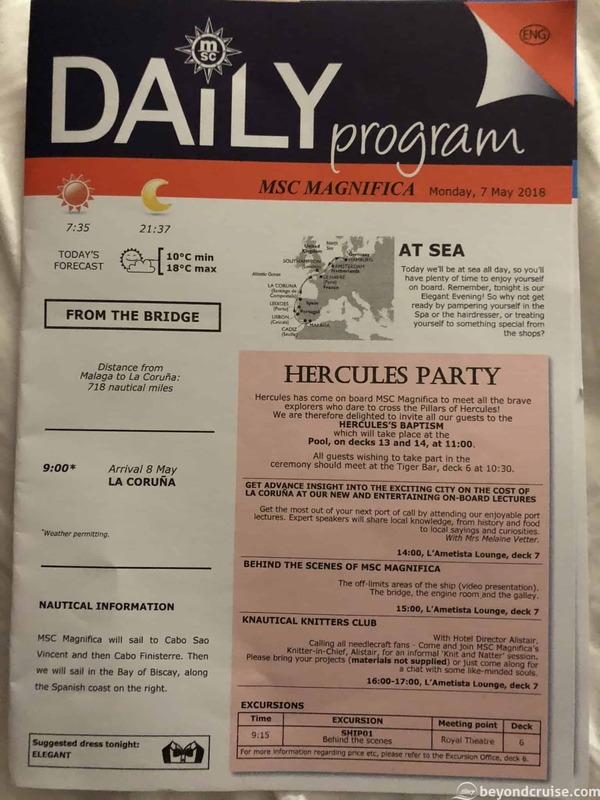 The first thing we go and see today is the Hercules Baptism Ceremony this ceremony is conducted as the ship celebrates the passing from the Mediterranean Ocean to the Atlantic Ocean, through the Pillars of Hercules (the Strait of Gibraltar). There are two (or more) different versions of why this part of the sea is called the Pillars of Hercules. According to some Roman sources, while on his way to the garden of Hesperides, Hercules had to cross the mountain that was once called Atlas. Instead of climbing the great mountain, he simply smashed through it with his superhuman strength – resulting in him connecting the Mediterranean Sea to the Atlantic Ocean. One part of the split mountain is Gibraltar, the other is disputed between Monte Haco or Jebel Musa. These two mountains have since been known as the Pillars of Hercules though. Briefly, the other version is the sea was already there and Hercules narrowed it to stop the sea-monsters in the Atlantic Ocean from getting into the Mediterranean Sea. 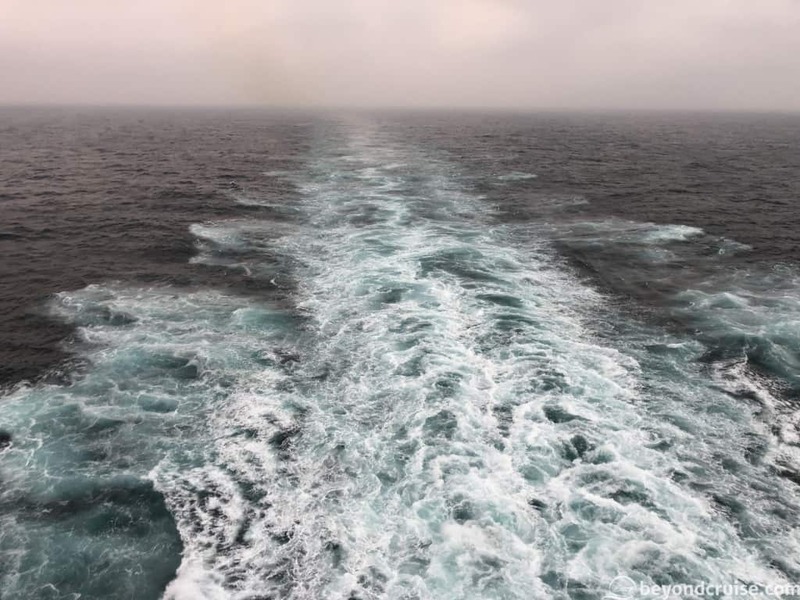 Either way, mythical and maritime traditions are interesting and not only part of cruise ship life, but most merchant and navy sailing traditions. 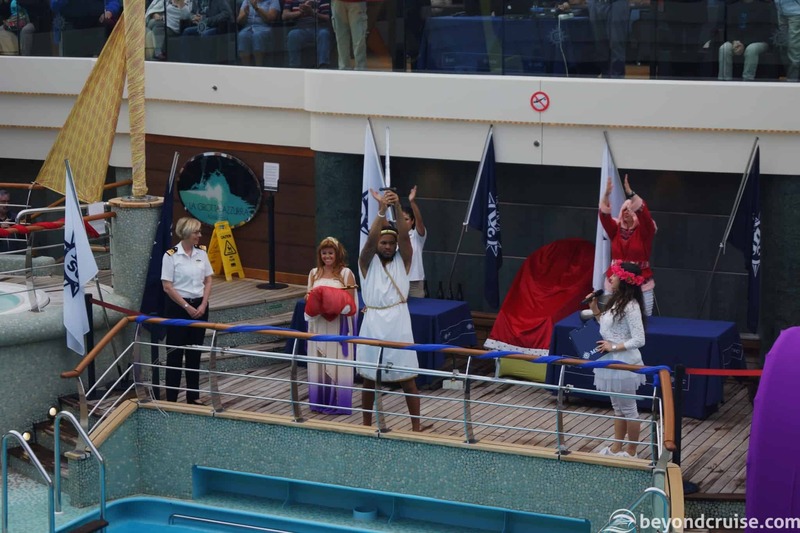 Back to MSC Magnifica, the Hercules Baptism was due to be conducted at the outside pool – but because of the aforementioned bad weather, it was moved indoors to the covered pool instead. We took up a good position on the deck above and watched as the ceremony got ready. The pool and surrounding area were wrapped in coloured fabrics, a DJ was playing music and staff were going around the venue offering free face-painting to anyone who wanted it! The venue was packed out by the time the ceremony started at 11am. The hostess and DJ were really great and got everybody into a good mood, clapping and whistling. Then Hercules came out and stood on the platform. A passing of the key ceremony was conducted and all the people who have never passed through the Strait of Gibraltar (Westwards) lined up next to the pool. Each one was anointed with whipped cream on their nose and head and then one of the hosts had a whole squid which she held up for each person to kiss! After that, they had a small amount of champagne ladled over their head and they had officially passed through the Pillars of Hercules! Many cruise lines offer this tradition for first-timers and whether you have passed through the area once or twenty times, it is always some good fun to watch the first-timers and the cruise ship staff join in. 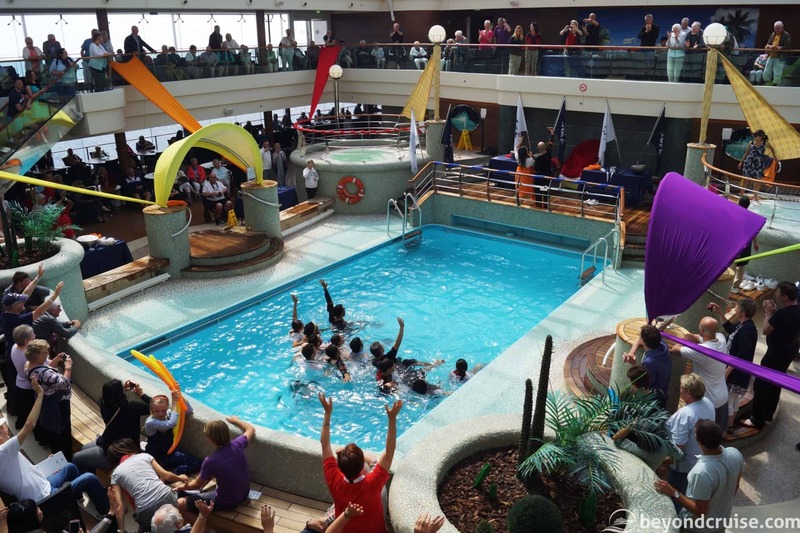 The cruise ship staff got everyone singing and dancing and one-by-one they ended up jumping in the pool – even the Cruise Director ended up in there! For lunch, we decided we’d dine in L’Edera on Deck 5. This is the restaurant below our allocated evening restaurant and offers a lunchtime-buffet and a la carte menu table service. We were shown to a large table of eight, by one of the oversized porthole windows. We were the only occupants of our table, unfortunately – (word must have got around that we’re cruise bloggers and we might talk too much cruise or something haha!). For my starter, I ordered the Seafood Salad and Sara had the Tex-Mex Chicken Salad, both were a decent portion and tasty. For our main course, we both had Conchigliette pasta Mediterranean-style – one of the great thing about MSC Cruises is they make all their own pasta FRESH onboard each day! The service was quick, friendly and efficient – just what you want when dining in the ship restaurants. Sadly, we are already sailing past Lisbon which is bringing back great memories, and a little later we’ll be passing Leixoes too. Thankfully, we are only on day 8 out of 15 – we have a while to go yet! This afternoon we are going to have a look around the Aurea Spa, which is located on Deck 13 – we’ll probably make a full visit to there on our next sea day. It has got very foggy currently and MSC Magnifica is now sounding her whistle every 2 minutes to warn other ships in the area of her presence. I guess it doesn’t help she’s totally white too! From previous experience, I always love the sound of the ship’s whistle as she is ready to depart a port or the noon whistle you hear on some ships. 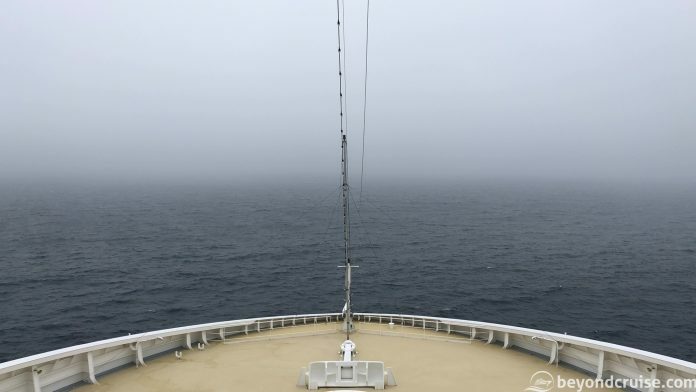 When it is foggy, all ships sound their whistle with a short blast usually every 1-2 minutes. 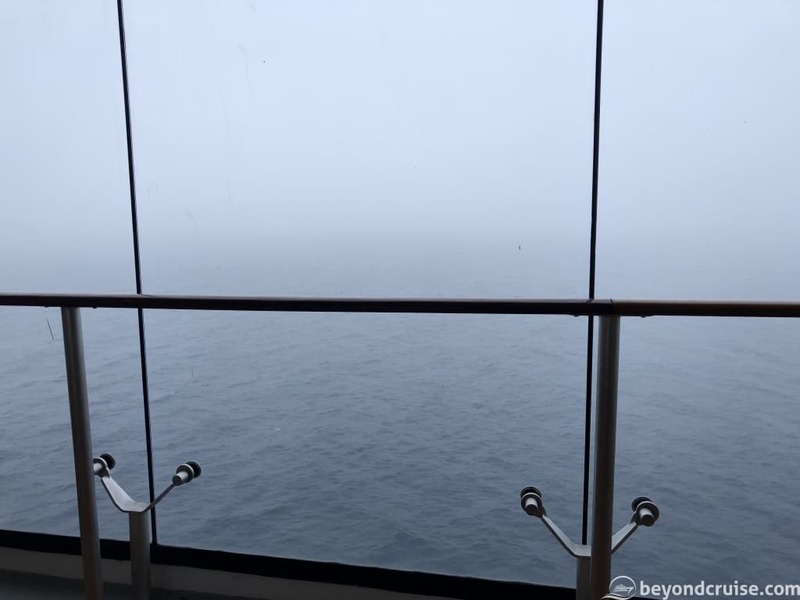 Here is a little clip for you from MSC Magnifica. This afternoon was spent exploring the ship a little more, we visited the L’Ametista Lounge on Deck 7 at the rear of the ship. The Hotel Director, Alistair Burnett runs a Knautical Knitters club with free tea and biscuits – there were several people deep in discussion about wool-types, where to buy them from on this route and doing some knitting! I can’t say I have ever seen this before at sea and I know it isn’t a huge sell for many of you, but it is certainly unique and interesting that the Hotel Director is there and runs it! Tonight is Elegant Night and we aren’t attending because we have work to do and we’ve actually got a reservation at the Oriental Plaza restaurant on Deck 7 tomorrow evening – that will be our night off! 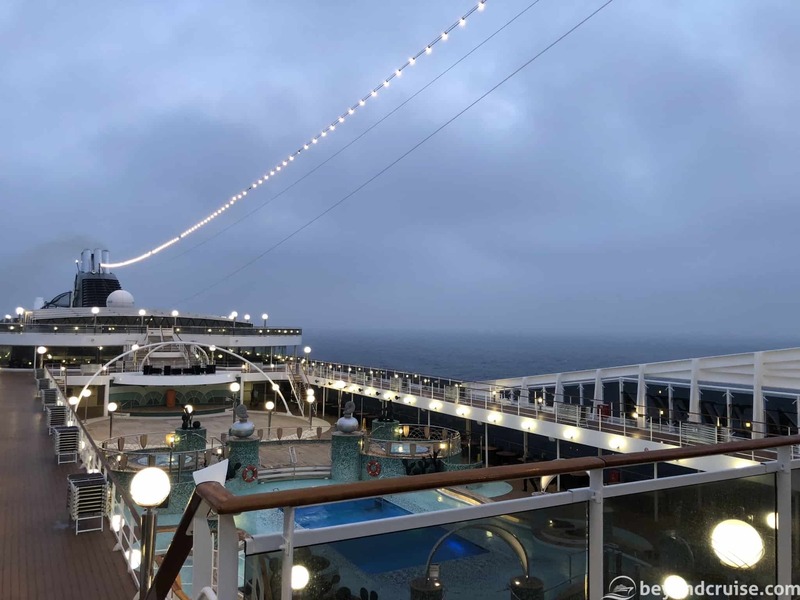 The evening carried on and the weather deteriorated further, the ship is moving around a little bit more now, in a noticeable pitching fashion. Tomorrow morning we arrive in our last Spanish port – La Coruna. It is situated in the North West corner of Spain and we’re looking forward to exploring the port for the first time. We have a couple of places on our list we’d like to see there, but we are only in port from 9am until 3.30pm as we’re heading to Amsterdam the following day and that is quite some distance!